After slaying his brother in 1E 478, Rislav Larich would be confronted by Emperor Gorieus and his Alessian Horde. But after successfully attacking them, Rislav's armies were pushed from the West Weald, and into the Colovian Highlands. Here, Gorieus' army had met with King Justinius of Kvatch's army, and were subsequently defeated, retreating into the Nibenay. Emperor Titus Mede II would lead the Imperial Legion in the final conflict of the Great War, known as the Battle of the Red Ring in 4E 175. He had split his army into three, giving them the signal to have them descend onto the Aldmeri Dominion. 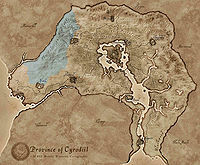 One his armies, under the command of General Decianus, would hide in the Colovian Highlands, near Chorrol. The Empire would later emerge victoriously and reclaim the Imperial City. 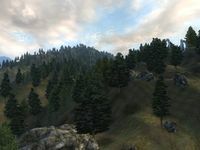 The name, "Colovian Highlands" may also refer to the greater region of Colovia, which consists of western Cyrodiil. This page was last modified on 14 April 2019, at 20:05.